New Media Rights is a non-profit program whose mission is to provide legal services, education, and public policy advocacy for creators, entrepreneurs, and internet users. Contact us to request legal services. You can reach out to New Media Rights to request legal services, or to request an interview or presentation. Please use the appropriate form, we look forward to hearing from you! Become a member of our community by becoming a New Media Rights Supporter! Learn about other ways to get involved and our different supporter benefits including prioritized response times. New Media Rights Executive Director Art Neill will be speaking at the Investigative Reporters & Editors 2017 Expo in Phoenix, Arizona. Our Panel "Protect yourself now: The independent writer’s legal guide to contracts, clauses & conundrums" will cover everything from newsgathering laws to copyright, to writers contracts. Here are the details and our final presentation embedded below. Value legal services for internet users and creators? Support them. Learn about our legal services for: App Developers, Artists & Graphic Designers, Bloggers & Journalists, Clothing Designers, Entrepreneurs, E-commerce Business People & Startups, Filmmakers & YouTube creators, Public Broadcasting producers,Game Developers, Internet users & Smartphone users, Makers, Musicians, Non-Profits, Photographers, Scholars, Researchers, and Writers and Publishers. 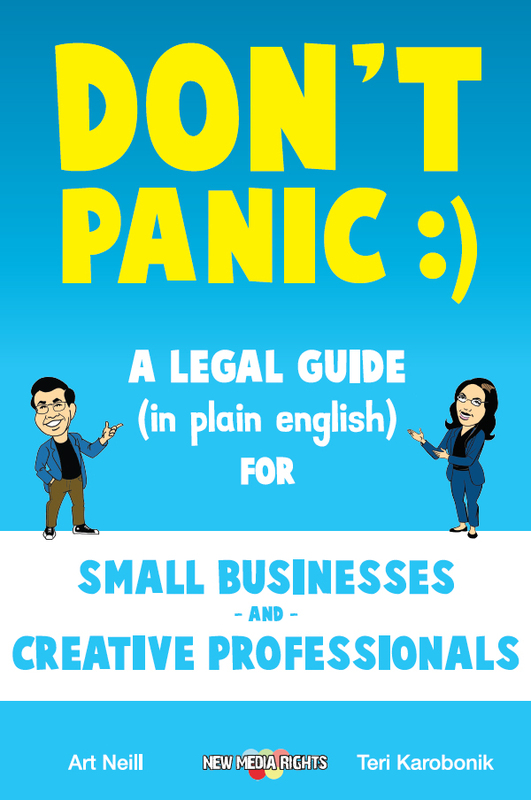 What's the best way to avoid legal problems for your business or creative work? Read our book! Ever wonder when you can reuse music, photo, or film clips from other sources? Find out with our interactive Fair Use App. 150+ videos to help you create. You can find our video guides here. Event: SD Film Week "Funding and Distribution for Feature Films"
In our new book, we focus on issues you may encounter from the inception of your business to the moment (that hopefully doesn’t happen) you get a nasty lawyer letter for the first time.